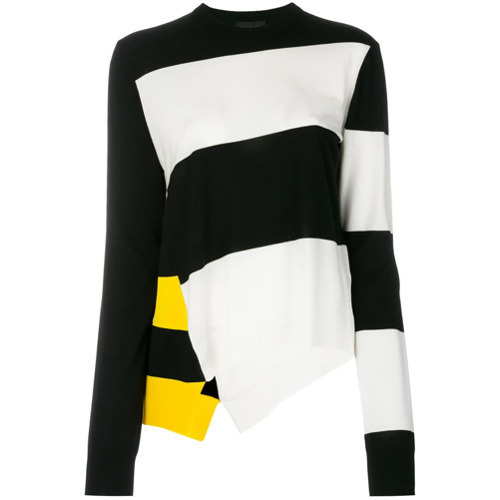 Such essentials as a Calvin Klein 205W39nyc Asymmetric Striped Jumper from farfetch.com and a black skater skirt are the perfect way to inject extra cool into your daily off-duty wardrobe. And if you need to easily dial up this ensemble with a pair of shoes, make black leather ankle boots your footwear choice. This combo of a Calvin Klein 205W39nyc black and white horizontal striped crew-neck sweater and a grey tweed mini skirt is definitive proof that a simple casual ensemble doesn't have to be boring. 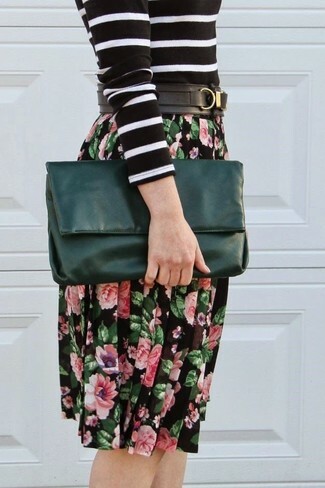 A Calvin Klein 205W39nyc black and white horizontal striped crew-neck sweater and a black floral midi skirt are a nice look that will easily carry you throughout the day and into the night. 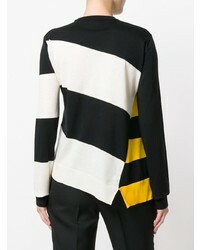 This pairing of a Calvin Klein 205W39nyc Asymmetric Striped Jumper from farfetch.com and black skinny jeans is ideal when you need to feel confident in your getup. For a truly modern on and off-duty mix, complement this ensemble with a pair of tan suede ankle boots. 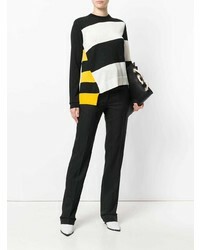 A Calvin Klein 205W39nyc Asymmetric Striped Jumper and black floral skinny pants are the kind of beyond chic casual must-haves that you can wear a great deal of ways. Bring a more relaxed feel to your look by wearing a pair of black leather lace-up flat boots. This casual combo of a Calvin Klein 205W39nyc black and white horizontal striped crew-neck sweater and black leather skinny pants is a safe option when you need to look great in a flash. If you want to easily dial down your look with a pair of shoes, why not add navy low top sneakers to the equation? For an ensemble that's super straightforward but can be modified in a great deal of different ways, team a black and white horizontal striped crew-neck sweater with a black pleated leather mini skirt. Add a pair of red suede ankle boots to this ensemble for a sense of refinement. 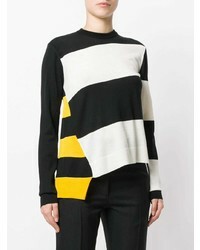 This combo of a Calvin Klein 205W39nyc Asymmetric Striped Jumper from farfetch.com and black skinny jeans makes for the perfect foundation for an outfit. For extra style points, complete your outfit with a pair of black leather ankle boots. Beyond chic, this combination of a Calvin Klein 205W39nyc black and white horizontal striped crew-neck sweater and a black mini skirt will provide you with variety. You can stick to a more classic route with footwear by rocking a pair of black suede ankle boots.